Carol and I were pleased and proud to attend Tara's certification ceremony yesterday, her induction into a universe of stars. She's a strong player in a generation keen to prove itself. 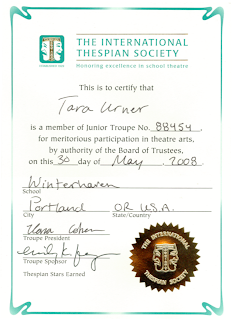 I was happily impressed by all the talent I experienced in that Winterhaven auditorium: lots of scripted and improvisational team work, individual self expression, a willingness to appreciate and honor peers. Got me a haircut today. Yakked about Ralph Bakshi cartoons. She'd taken some children, not realizing "cartoons" might encompass such adult themes. Fritz the Cat maybe. Then I came home with a hankering for some All American Hebrew National hot dogs, boiled, in a bun, with onions and mustard, ketchup if feeling bold. I got these at Freddies the other day, might've been something Derek said, about really tucking 'em in (putting 'em away) when a jock, made me nostalgic for old football injuries (I have a damaged toenail from my International School days -- kinda humid for outdoor sports I thought). Mostly I'm back on the treadmill today, revamping old code. Saturday Academy was a workout, gave me a skills boost. I'm supposed to invite Microsoft as a sponsor of Europython, looks like. I also suggested ConocoPhillips. So this isn't exactly my design for a Verizon call center in the Andes, but no one said it's "either/or". Global university students circulate among centers, checking out the solutions. Diversity rocks. This PBS documentary follows the lives of crew members aboard some USS something or other (one that has planes). As a Quaker, it's hard to be fair to these losers and their profligate lifestyle, so not American in any way I treasure (except the good friendships part). So I won't even try. Competently shot, a good recruiting tool if you're into being a LAWCAP missionary (FYI, LAWCAP is some like old dead computer language some people still use, like COBOL). I'm letting Tara watch as much of it as she likes however, walking through with coffee now and then. "Are they still on the boat?" I ask. "Of course they're still on the boat" she replies. I was thinking maybe it's like Lost, where they finally get off the island. My take on the VA not tracking suicides story is that VA guy CBS keeps interviewing who goes "Shhh!" is an absolute crack up, one of the funniest men on television. I'm glad they kept him on. If I were a vet considering suicide and saw that guy on my screen, I might get really mad, throw my shoes at him, kill my television. That'd be a step up, for a lot of guys. Barney the dinosaur also a scream. I joined Central Friends on a field trip to Medical Teams International this afternoon after potluck. This headquarters warehouse nestles amidst other light industries, corporate campuses, plus serves as a visitor center for those curious about state of the art relief work. This is a no-nonsense NGO, self-branding as Christian, committed to low overhead, and high levels of expertise, although it does accept volunteers. The museum looks at both natural and man-made disasters, both overseas and intra-coastal. As its track record lengthens, they'll need to replan the rooms. Today's more sophisticated relief agencies work very closely with local partners closest to the action. Those on the ground often know best what's really needed. A first step in any disaster is to collect relevant intelligence, not to have some knee-jerk one size fits all response for everything. The museum was very clear on these points. I appreciated the stark simplicity of the design and imagine NGOs with a different mix of religious and/or secular affiliations could nevertheless benefit from studying this example. I don't know how many universities offer degrees in relief work, but I could see where a Harvard Business School might want to jump on the bandwagon. In my earlier experiments with the I-Ching, I used Chinese characters as string literals within Python 3.0 (alpha 2) source code. 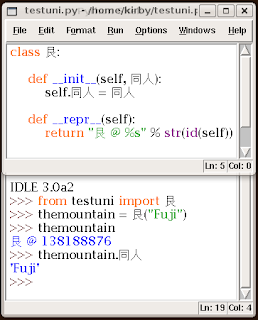 In the screen shot above, developed on my newly upgraded Ubuntu Dell, I'm actually using Chinese characters as full-fledged Python names, not just as quoted strings. Not knowing Chinese, I'm not suggesting my particular choices make a whole lot of sense. Also, given self is not really a key word, I might have used a word from yet another language in place of it. 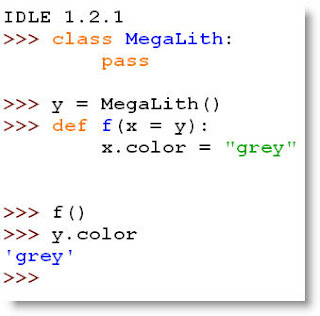 However, we tend to consider it quirky to swap out self for some other name in Python, so I left it alone. Yes, I realize Mount Fuji is in Japan, not China. Did you know that the Japanese language includes many Chinese characters, called kanji? My advice to fellow Quakers, as a parent, was to stage some fun outdoor activities this summer, like joining a hobby rocket club as an extracurricular activity. Walking my talk, I looked up Tom Higgins recently on Hawthorne, Trevor too. Apparently the park ranger was very against the idea for this time, talked about calling Homeland Security or something. Very Norman Rockwell, this idea of boys and girls, parents and pets, having some fun with their homemade cardboard craft, which are supposed to emit a little parachute, so you can reuse the hull, even nose cone if you're lucky. Then everything suddenly goes dark as the "verboten" signs go up everywhere. We've all seen those movies too. Usually the Americans show up and rescue us, so this time we're in a quandary. Definitely a well written essay that makes the author's views clear. Much to agree with, about the current math curriculum being corrupt and close to useless waste of time, a complete rip off. However, with art, music, language and everything else, students have a legitimate concern that they get interesting careers that keep them gainful, and yakking up the sheer back of the napkin fun of free math play, doesn't speak to that question. College affordability a real issue today so let's not forget the pressure on high schools to provide staffing directly, distance ed for the college credential only after a first position, so some skills already relevant (so what did math give you, any programming?). That's why in Silicon Forest, this essay gets passed around more to get the wolves salivating, as we see fair game, a wounded member of the herd (math curriculum) that's a nightmare to kids (a form of abuse then, criminal, ready to be taken out). But what we replace it all with won't be just about triangles on napkins. Operating heavy equipment, building railroads, using object oriented math, is still important, neither "approximate" nor "ugly" (his "leave that to the scientists" attitude is just not appropriate unless you're freakishly overspecialized -- as this guy clearly is). Sort of a John Taylor Gatto type, this Lockhart gentleman. Anyway, fair warning that change is under way in our thinking-ahead schools. Status quo momentum: nothing to do about it, except watch things unfold. We've enjoyed a recent spike in activity on edu-sig, a Python community list with a public archive. Programmers need accurate mental models of how their computer languages manage memory. This month, our resident experts weigh in on what models to use and how best to communicate them. Yes, I was thinking of Shomar when I mentioned the English Mastiff in my example. Speaking of programming, I've modified my beer intake regimen (near zero for nearly a year) such that I'll sometimes sample homemade noncommercial brews, if/when these are offered. Home brewing is a favorite pass time in Portland. I might also permit myself to enjoy a festival or two this summer. Still no random pints "just because I'm in the mood" though -- I wasn't spending those extra calories wisely, if at all. In this director's cut, set against the same mythical background as Hairspray (Baltimore, a little earlier though: 1953), we get to observe worlds in collision, in school, at the party, in court... in prison. These John Waters style Juvenile Delinquents are more Nashville in flavor than the ones in West Side Story (Baltimore is further south after all). The Squares are east coast preppies, descendants of teacuppy Victorians (note Alice in Wonderland allusions). The generational divide between these teens and their parents is in the foreground throughout. The older Squares just never seem to get it about their sometimes Drape offspring and all that youthful, cross-cultural Jahiliyyah. I loved the Traci Lords character, Wanda (a Drape), her Square mom played by none other than Patricia Hearst (aka Patti Hearst). Also fun seeing Willem Dafoe, a favorite from eXistenZ. No drag queen in this one. I could see assigning this in some college psych-anthro course, like the one I took at Princeton (Imee Marcos a classmate) reading Clifford Geertz and such. A lovely film, explains a lot. I crossed paths with Bob McGown today, as I was lugging home some groceries. The guy was on his cell with Evergreen Aviation Museum (home of the Spruce Goose), clearing the way to field test some telescopes, with an eye toward some Star Party down the road. Those Periodic Table shower curtains looked cool. 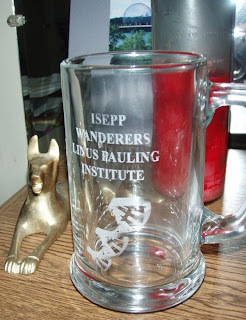 After meeting his friend at the eatery, he ushered me over to Pauling House where he had these new Wanderers mugs, only $15 apiece. I was happy to get one. Note this wasn't a scheduled meeting, just a random encounter between Wanderers.